This lease deal works for us based on our need, our driving habits, and a unique incentive offered by the state of Georgia for the purchase or lease of an electric car. The car we decided to lease is the all electric Nissan Leaf. The terms of the lease for two years (for a 12,000 mile driving limit per year) called for $1,000 down with payments of $377 per month. We will also see an increase in on our electricity bill because we will have to charge our car each night. Our research indicated our costs would increase by about $30 per month. Our insurance premiums will increase only slightly as we will be selling one of our current older vehicles and taking on a new one. To break even on this lease deal has much to do with the state of Georgia where we live. Several years ago our legislature passed into law a $5,000 (at most) tax credit for consumers who wanted to pursue the purchase or lease of a certified Zero Emissions Vehicle. To that end, electric cars are starting to take on great popularity here. Charging stations are popping up all over, making the greater Atlanta area one of the biggest markets for electric cars in the country. So in the next week or two, we will be sending our paperwork into the state and we will get a notice from them stating that our tax credit is approved based on the vehicle we leased. We will take the credit off of our 2014 state tax liability when Mrs. Luke1428 does our taxes. Now we won’t use it all this year, but whatever is remaining will be carried forward for up to 5 years. In effect, by leasing this Leaf, we will be paying $5,000 less in Georgia taxes over the next few years. So the tax credit gives us a big boost in moving towards breaking even on the lease. It doesn’t make up the entire difference however, so $6,056 in savings will have to come from somewhere else. Where is that big difference going to be made up? The additional savings will come from our reduced gasoline costs. My wife has been driving our Toyota Tundra to work each day, averaging 135 miles per week. At best, the vehicle gets 14 miles to the gallon when driving in city conditions. Given the current national average of gasoline being around $3.00 per gallon we calculated a savings of $3,008 in gas over two years from her driving to work each day. So now we are up to $8,008 towards the total cost of the lease. So we will have to realize $3,048 more in savings. I mentioned we signed a lease deal that allowed us to drive 12,000 miles per year. With Mrs. Luke1428 driving the car to work each day we use up 7,020 of our allotted 12,000 miles. So we have an additional 4,980 miles on the lease that we have to use to make the deal work. The total gas savings over those last 4,980 miles at $3.00 per gallon comes to $2,134 over two years (4,980 miles divided by 14 mi./gallon times $3.00/gallon times 2 years). We will also realize a savings in some maintenance costs, such as changing oil and filters. There is no need for that in an electric car. Assuming a national average of around $30 for this service and that we would change our oil every 3,000 miles, we will see an additional savings of $240 over two years. As you can see, we have come up short on the total deal $674. That’s $337 dollars a year or 94 cents a day. As you can see this deal works for us. I’ll pay $674 to get into a new car for two years. That’s a quality deal from my perspective. If we don’t drive the car 24,000 miles in two years we lose on gas savings. If we drive more than 24,000 miles in two years we will be charged excess fees for every mile we are over the limit. If gas prices fall significantly we lose more in gas savings. We can be charged if there is above average damage to the vehicle when we return it. If we are not forward thinking enough, we could be unprepared to make another car decision in two years when the lease is up. Most importantly, we have to plan our driving more than the average person. The range of the Nissan Leaf we leased is only 90 miles. And of course there is not a charging station on every corner. Ironically, the best case scenario is that gas prices stay where they are or increase slightly. I can’t control that though so I’m not even going to worry about it. The biggest issue for me is what to do in two years. Will the tax credits still be available? I don’t know. Will we be able to negotiate another lease that works? I don’t know…it was really hard this time around. What will the needs of our family be in regards to how much we are driving? Again, I don’t know. So we will begin to save immediately for that circumstance by putting money aside each month into a future car fund. In two years we should accumulate enough to purchase a nice used car should all the tax incentives fall through or our family needs change. We will be prepared in two years to make another good call that makes financial sense for the family. For now I’m excited to have a new Nissan Leaf. I’ll share more about the process of leasing a car later and what to look out for. As I already have mentioned we worked really hard to get this deal to make financial sense. We could not (and would not) have done it without the benefit of the tax credit. 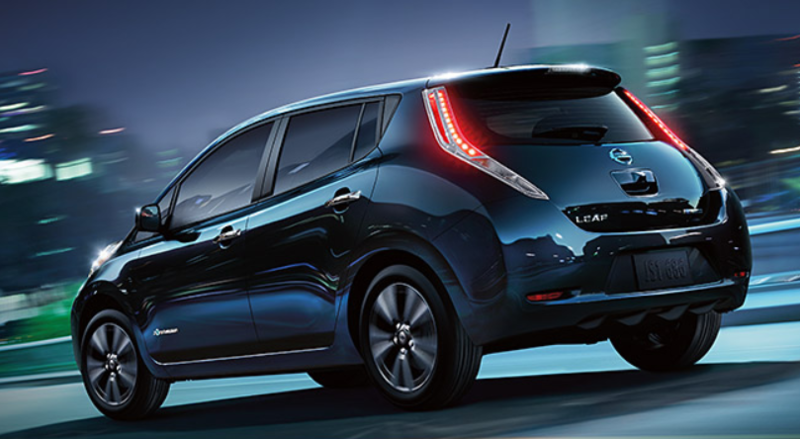 I’ll drive the Leaf for several months and then do a review of the car. The early returns are positive as far as the driving experience goes. Questions: Have you ever thought about leasing a car? Why did you do it? Based on our scenario, do you think it was worth it to pay $674 over two years to be leasing a car? Do you have any experience with an electric car? Next Post: Should I Save For Retirement or the Kid’s College First? Interesting, Brian! I would likely never lease a car, but in a situation like this, it sounds like it’s well worth it. I looked at the Nissan Leaf awhile ago to compare the costs and I had come upon your article talking about the advantages of the leaf in Georgia, but I thought you already had one? Is this the second one that you will have now? Anyways, I think in your situation it is a great deal. But that lease amount seems high, is it because of the costs of adding a charging station in your garage? The advertised rate here is $2,200 down payment and $199 / month for 36 months also 12,000 miles a year. Not sure what options you are obtaining or if there is just that great of a demand in Georgia? Did you perhaps look to lease from an out of state dealership to see if you could get a better deal? We didn’t have one before…I just published a post based on our research and knowledge about the program. We finally took the plunge ourselves. Sadly there are consequences for living a debt free, no credit card lifestyle. Because we are debt free and off all credit, our credit score is on the way to zero. In fact, it’s pretty bad. So even though I could buy the Leaf outright with cash, we couldn’t get the best possible deal b/c of our poor credit score. Financially speaking we are an A-list consumer. But we got the B-list deal. It may have been better to wait until our score actually reached zero before we purchased. I’ve heard it’s actually better in the eyes of creditors if it is zero than the low score we now have. Ironically, having the lease now will cause our credit score to rise again. So maybe we will get an even better deal the next time around. I don’t think I would ever lease a car, but you certainly did the math and decided what was best for your situation. I am very curious to see how the Leaf performs. I would love an electric car, but the logistics for charging probably won’t hit our area for years. Would it be possible to take a road trip? What is the charging availability in the South? There are many charging stations in greater Atlanta. The Nissan dealerships have charging stations that will complete a full charge in 30 minutes. But we couldn’t go long distance (outside of the metro area). The battery life just isn’t there yet. That’s why this doesn’t make practical sense as our main vehicle. It’s sounds like you’ve more than thought through this expenditure, so I think it makes sense. I think the biggest risk is lower gas prices. I see that as a real possibility. Lower gas prices would certainly harm this deal. But we’d save on our primary family vehicle so either way we win I guess. OK first let me get out of my system, “You should never lease a car”. I’m good now on to the real questions. Even Steven recently posted…Closing in on Paying off Student Loans, How Should I Celebrate? Haha…I’ve always said the same thing about leasing a car. Guess “never” is a long time. No…it’s not going to impact our habits. If the incentive is not there we won’t do another one. It’s purely being driven by the tax credit from the state. That’s what makes it a deal worth considering. Wow, you are the 2nd person recently (Sam at Financial Samurai) to go the lease route. I usually buy used cars just back from leases because they have to be kept immaculate by the prior owners. I like to spend a little extra on cars because I watched my parents go cheap and just had constant repairs and spent more money on repairs than they would have just buying something a little nicer and newer. Hard to say if there is an ideal situation for all people. You just have to do what works best for you. No one was more surprised than I. In the end it made financial sense to do it for two years given the incentives we were offered. You won’t get any guilt or shame from me, but that’s not really my style anyway. 🙂 It sounds like you and Kim really thought through this to make sure it was the right move for your family and that’s what matters. The tax credit is fantastic too. I have not driven an electric car, although they are definitely gaining in popularity in California too. The driving part is really not that different. Good power, nice ride. They definitely don’t work for everyone though given the limited range. I have leased two cars before. The main drivers behind those decisions where the payments were within my ability to afford. I couldn’t find a reliable car in my area which I could afford to “buy” via a bank loan. Now, my financials have changed and that is not a problem anymore, but I know why people lease. Remember, about a quarter (maybe more now) of all car sales are leases each year, so the market is big. Yes, there are little benefits to leasing, except for lower maintenance costs and lower monthly payments. Grayson recently posted…When Life Gives You Lemons, Don’t Just Make Lemonade! I was surprised at how big the market is for leases. Having never done this before it wasn’t something I’d read about. I’ve seen other people take advantage of the tax credits recently. Pretty cool stuff! We’re not really in the market for another car right now, otherwise I’d definitely be looking into something like this! Nice work on doing the smart thing, even if it goes against the grain in general. Thanks Ben. This one really goes against the grain. My wife was ready to pull the trigger long before I was. Of course she works with a bunch of CPAs who have all the low-down on the tax credit, so she was more comfortable with it. I’m considering the same thing, but keeping my current car as well. It’s a 2001 audi TT and gets about 25 MPG, but uses premium gas. I drive about 15,000 miles/year for work with about 12,000 of those being in relatively short distances. In Colorado we get a $6,000 tax credit. The way my math worked out was, even with having to insure both cars, I come out ahead after a 3 year lease. At the end of the lease I can turn my Leaf in and likely use my audi for trade leverage on a new electric vehicle with a much larger range (Tesla has a $35k sedan coming out in 2016 with a 250 mile range). That tax credit thing is the ticket. With out that, none of this makes sense. Thanks for sharing! I was wondering what other states had a similar tax credit. You might want to check out some forums on the Leaf. We read in several places that the mileage on a Leaf doesn’t perform as well in cold weather climates. It reduces the battery life. Someone we read about in Colorado said he was only getting about 45-50 miles on a full charge during the winter. One issue is that the heater pulls a lot of power from the main battery. Yeah…average winter temp outside in my part of CO is 42-50 dec, jan, and feb. The heater is an issue, but there would be why I would keep my AWD fuel efficient(ish) Audi. LOL. Car leases and time-shares are the two things that are fun to talk to people about because there is never any shortage of takers who will try to break it down and show you what a great deal they got. Regardless of whether you saved any money or not, good for you and enjoy your new ride. “…who will try to break it down…” Haha…I know. I felt odd just trying to write this and explain what we were doing. I have no experience with electric cars but have leased a couple. We felt that we got what we paid for and it was nice to always have a car under warranty. No repair bills! I know leasing is like a vulgarity in the personal finance world but if it is ok to rent a home, why is it not ok to rent a vehicle? It’s considered not OK to rent a vehicle because most people get taken on the deal and pay too much. And there is nothing left to show for it at the end of the lease. I think for me it would come down to what happens once the lease is over. I would feel like I’d be back at square one instead of either owning a car outright or having very little to pay on one. It is nice about the gas savings though. “…what happens once the lease is over.” You are exactly right Tonya. That is a risk we have to face. Once we sell our other vehicle we will begin to save money each month for when we face that decision. In two years we should accumulate enough to buy a used car should the tax credit go away or our family needs change. I won’t do another lease if the financial incentive isn’t there. I actually have a leased car and it’s predominantly work related. I also feel as though cars in general are bad investments, though, and I think there are few people out there who feel really good about their car investment scenario. Friends and clients I have who have paid off cars seem to have a number of repair and maintenance costs and clients and friends who lease have ongoing monthly costs. It looks like with the tax credits, though, you have a great deal. My hubby’s car is a hybrid and it saves us a bunch of gas money every year. “It looks like with the tax credits, though, you have a great deal.” I believe so. The tax credit is really what is driving this decision. We wouldn’t have committed to a lease otherwise. Many other people in GA are taking advantage of this.